Muhammad Rabbani wasn’t shocked last winter when he was stopped by British authorities at Heathrow airport. It would’ve been more astonishing had he simply walked up to the passport counter, declared his business and been allowed to pass. A British activist whose work entails the defense of people affected by British anti-terror laws—and the war on terror, more broadly—Rabbani has spent hours in detention whilst traveling in and out of the UK. But this Wednesday will be the first time he’s faced criminal charges resulting from such an encounter. 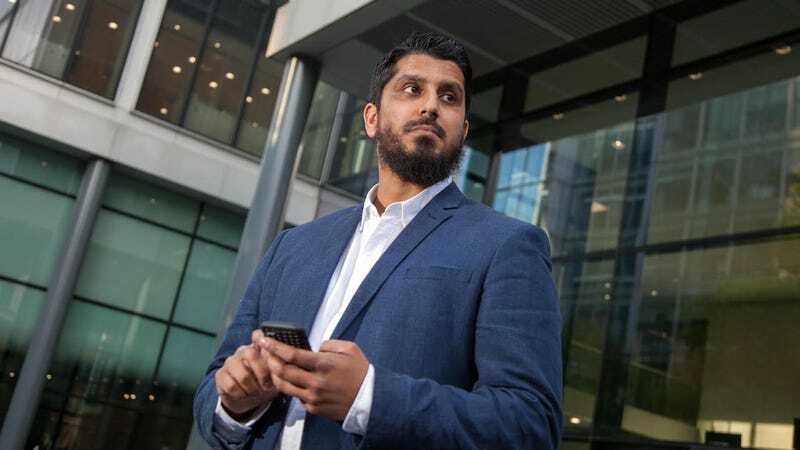 Although not suspected of any crime, Rabbani, 35, was detained by police for several hours at Heathrow, just as he had been “about 20 times” before. This time, however, he was carrying a laptop, the contents of which include information he describes as relevant to a case of torture involving the US government. Asked to surrender his password and decrypt the files, he refused. Four hours later, Rabbani, the international director of the human rights group Cage, was arrested and taken to a police station in the London borough of Hillingdon, where he spent the following day in jail. He was held under Schedule 7 of the Terrorism Act, a law which grants police broad powers when it comes to the detention and interrogation of British citizens entering and leaving the country. A citizen need not be suspected of committing any crime before being detained for up to six hours, during which time they may interrogated or have their electronic devices searched. Refusing to answer any question, or cooperate at any point, constitutes a criminal offense. Update: Rabbani was charged Wednesday morning under Schedule 7 of the Terrorism Act 2000. He is due to appear before a Westminster magistrate on June 20. Tens of thousands of people are detained each year under the 2000 law. As many as 561,660 such interrogations took place between 2015 and 2016, according to the Middle East Eye (citing British Home Office figures). In the same period, as many as 551 people had their biometric data collected, and 1,677 had mobile data downloaded by police; under Schedule 7, police are authorized to conduct what Rabbani has come to describe as a “digital strip search,” even without reasonable suspicion. Cage describes itself as an “independent advocacy organization working to empower communities impacted by the War on Terror.” The group, which includes a former Guantanamo Bay prisoner released without charge, often provokes what Rabbani calls “uncomfortable conversations” about how Western nations deal with the threat of terrorism—and in particular, actions that are perceived to stir resentment among, and radicalize, young Muslims. In an interview Monday with Gizmodo over an encrypted phone call, Rabbani described his experiences being detained under Schedule 7 and further explained why he’s refusing to hand over his passwords. Gizmodo: How many times have you been stopped under Schedule 7 and what’s that process generally like? That part of the stop lasts about a half hour. There’s no questioning beyond the basic things, like: “Where did you come from?” “What was the purpose of your trip?” “How long were you there?” If it proceeds from there on to something further, then the Schedule 7 process begins at that point. The Schedule 7 process is divided into three stages. There’s a screening stage, an examination stage, and there’s a detention stage. As you progress through the stages, you lose more and more of your rights. The screening stages, for most people who are not aware, is a part of Schedule 7 stops, but it’s not recorded. And that’s a crucial difference, because the authorities do not collect data on how many people they’ve stopped under the screening stage. What they do collect is when it goes on to the examination stage, which lasts a maximum of one hour. Under the examination stage, you’re essentially interrogated, searched, and you have no right to remain silent. That’s pretty much it. Under the examination stage you can be searched, your devices can be confiscated, and because you have no right to remain silent, this is where it’s connected to the gist of my case. You have to answer when they ask you, “What’s your password?” Most Schedule 7 stops, that’s enough for the authorities to collect data on you. But some progress onto the final stage, which is detention. In that stage, your DNA can be taken, fingerprints can be taken, and you can be strip searched physically. Now, in the process that I’ve described, there’s never a suggestion that you’re suspected of a crime; there’s no accusation of a crime; there’s no formal accusation of anything. In fact, the opposite is usually asserted: “You have nothing to worry about. You’re under no suspicion. We’re just going to ask you some questions.” But obviously, you can see how invasive the entire process is. So that’s typically what happens and that’s what I’ve experienced on the many, many occasions that I’ve been stopped coming back to the UK, particularly; sometimes it’s also on the way out. Gizmodo: How often do you get to the detention stage? Does it happen every time? Rabbani: It’s not often. It’s some of the time. I can’t remember how many. But I think the important thing here is, whether I or somebody else reaches that stage, it’s actually secondary. The most important thing is that such powers exist to begin with. There must be a logic to creating powers, and I think that’s one of the reasons why we’re bringing this challenge and trying to raise awareness around it—to say, there are laws currently operating in the UK, which are not consistent with due process norms. And they’re not consistent with, what we call in the UK, the rule of law. And that cannot be right. That simply can’t be right. Everyone should, before denying a person their liberty, they have the right to at least know what wrong that they’ve done, or what they’re suspected of doing. I was saying to a colleague earlier on today that if, right now, I went outside onto the streets of London and some police officers came and stopped me and arrested me and said, “We believe you’re involved in a murder,” I’d have more rights at that point, accused of being involved in murder, than I would have arriving back home from a trip abroad at the border. So that’s the disparity that we’re trying to highlight. Gizmodo: You were arrested and then released, but still you’re facing charges this Wednesday? Rabbani: That’s exactly correct. I was arrested and held for one day in prison. When I declined [to give up] my passwords, I was handcuffed, taken to a police van, and taken to a police station locally. I was held there for one whole day while they worked out what to do. And they decided not to charge me, so I was bailed to appear at a police station a few months later. So that’s the situation I’m in. Rabbani: The one that I was kept at, it’s called Polar Park Police Station. The one I need to appear at is called Bethnal Green Police Station. Gizmodo: What’s the range of potential consequences you face for not surrendering your password? Rabbani: As it stands currently, if I’m found guilty, the worst case scenario is I land in prison for three months. The sort of better scenario is I end up with a fine. But it’s a terrorism conviction. So what would happen is the court will more or less determine that I’m a terrorist which is quite crazy because there’s no terrorism involved in this. All it boils down to a password. And it’s something that I believe anybody, any person in my position would try to do: protect their clients or patients. But I must also add here that the police have threatened me in a formal letter to my solicitors that—I’ve already said that I haven’t given my passwords, but they’re also still trying to get my passwords, even though I’ve committed the alleged offense and it’s done. It was done in broad daylight in front of other police officers. There’s nothing more to determine. But what they are wanting to do is still get my passwords. So what they’ve said to my solicitors is that they will be considering making an application under a different law called RIPA [Regulation of Investigatory Powers Act]. Under that power, if they pursue me and my passwords, I’ll be facing five years in prison. So that’s the real nightmare scenario. And again, it’s all based on a password. Gizmodo: Have you been unable to travel since your arrest? Rabbani: Actually, strangely, no. In that regard everything’s been okay. I’ve actually travelled on maybe two or three occasions since then. Nothing’s happened. But of course, I’ve been very, very anxious about what may happen. And I couldn’t take my devices with me at all on these trips. I was really worried, in case it leads to a further arrest or further accusations, then I’m just gonna be in a really, really messed up position. And of course, there’s an impact on my family. And I think there’s another impact, because I’m the international director of this organization that specializes in documenting cases of Western government complicity in torture. So, our current investigation that we’re in the middle of, one of the unintended consequences—I’d like to think, because I don’t believe in conspiracy theories—has been the interference in this ongoing investigation. We’ve also made that point to the police, that, you know, you need to give back our devices and let me get on with the work that I’m meant to, in order to get accountability for this torture victim. But instead what’s happening is, it’s almost as if the state is interfering in the work of an independent NGO. You can imagine the headlines if, for example, the Russian authorities did the same thing to an Amnesty International activist who was investigating Russian crimes. You understand what I’m saying? It’s essentially the same thing. And, in fact, what we need is higher standards to be upheld in Western countries. That sets the standard. And that’s a really important responsibility. Gizmodo: How did you get into this line of work, tackling the war on terror and its effect on Muslim communities? Rabbani: My connection to this is from two angles. One is my own personal experience. I think I’m not unique in that because I think I fit a profile at the time. I was, say, between 20 and 35, brown, an overtly practicing Muslim, and I was probably associating with other practicing Muslims. And not only that, but because of the roles I played in my community, I had a degree of influence. Maybe these things attracted the intelligence services to try and approach me and try to recruit me. And, of course, I didn’t like that type of behavior. I wanted things to be done in a transparent and open way. But I think the approaches were always very underhanded and coercive in their nature. And I didn’t like that. I actually went to the media. I went to lawyers. And then I came across Cage and they offered support. The other angle is, my roles prior to joining Cage have been primarily around crime prevention and conflict resolution, particularly amongst young men who are disaffected and at risk of being involved in street crime and violence and gangs. The idea of conflict resolution is something that means a lot to me. Trying to find an ending to conflict. Of course, the context is different. It was about young people coming into conflict with other young people. The war on terror is about a much, much broader, grander, and more devastating type of conflict. But I think those ideas, as I grew older, they also influenced me to try and get involved in some sort of initiative, to make some sense of this never-ending global war that’s going on between seemingly two sets of people all over the world. Gizmodo: The case you’re preparing, it involves accusations of torture in which the US government allegedly has a part. Is there anything else you can say about your investigation? Rabbani: I’d love to, but I can’t at this stage I’m afraid. We’re going to have to wait and let the legal aspects of it lead everything that we say. We have lawyers in the UK, as well as the US, so we’re following their guidelines. And they’re obviously very, very anxious as well because, what I’m facing is connected to…. almost like the interests and developments of the other case. So I have to be very careful. But I think I can say that, in due course, we’ll be making all of this public. I was going to draw one other point because you’re based in the US and your readership are too probably—I’m just making an assumption but I’m guessing most are in the US—there’s a very interesting difference with what we’re seeing in the US, with border authorities compelling people to surrender their passwords, and the power that we have in the UK. There are two things actually: Number one, all the concerns around the Trump administration and border authorities and the way they’re handling travelers coming to the US—correct me if I’m wrong, but I think most of that is being implemented against people who are traveling into the US who are not US citizens. What’s interesting is if you contrast that, if you look at what we have here in the UK, it’s actually directed at British nationals. It’s not directed at foreigners or tourists or anybody else. Although it can be used against them, the vast majority of people who actually are subjected to this type of detention are British citizens. So it’s like, you’re coming back home to your own country, and then you’re met with this type of welcome and this violation—which I’ve been calling a “digital strip search”—so that’s one difference I thought I’d noticed. The other was that, in the US—again, correct me if I’m wrong—when somebody is stopped at the border like that, they have the right to remain silent. Here, in the UK, it’s a criminal offense to remain silent, meaning there’s no right to remain silent. If you’re stopped and you’re questioned and don’t answer, that’s a criminal offense. That can land you in jail. The third and final thing is, this power has been in the UK since the year 2000. Each year, on average, 50,000 people are held and detained using this power—and these are Home Office figures—which is a total of about half a million people (over the past decade). So there’s a huge number of people that this is affecting. Huge amounts of data that’s being collected. And all of it is without suspicion, or formal accusations. Another way to put that is that they’re completely innocent, law abiding citizens going about their business, but under this pretext of protecting national security, and preventing terrorism, this law has been active all this time—which is, I think, a travesty. According to the research we’ve done here at Cage, there is nothing like this power anywhere else in the Western world.